From left, North Eddy County United Way members Toni Cano, Leah Boone and David Taylor stand with the United Way chile at Artesia National Bank. The United Way hopes to fundraise $157,000 this year. Those interested in making contributions may mail them to North Eddy County United Way, P.O. Box 990, Artesia, N.M., 88211-0990, or contact Cano, executive director, at 308-2702. 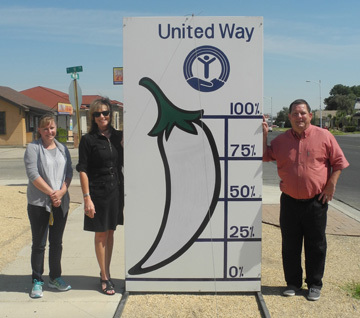 The United Way also wishes to thank Randy Scott and Wade Nelson of Central Valley Electric Cooperative for erecting the chile sign.